I'm in Chicago and will be live streaming Gene in an interview with Sarah Willis (horn in the Berlin Phil) as part of the legendary 'Horn Hangout' series this afternoon. We'll be live with Gene at 6pm Chicago time. Hope you can join us - your chance to ask Gene all your questions via the live chat. Last edited by tubalux on Wed Mar 21, 2018 8:24 pm, edited 1 time in total. Really enjoyed that special interview with Gene Pokorny, highly recommend watching once it is posted on the horn hangouts site! He was pretty special! What a guy. will the video be up soon? tubalux wrote: He was pretty special! What a guy. Great interview. I loved it! Be sure you have an hour or so set aside to view this fantastic interview. Once you start watching, you won't be able to stop, they're that engaging and informative. Bravo! Clickbait statement! Are you trolling us? Fantasic. Seriously, this was great fun to watch. No BS, but also an entirely personable and humble guy. That's interesting that Barenboim preferred the sound of the BBb. 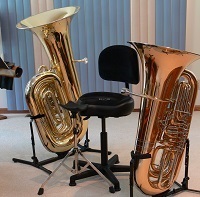 I wonder what type of tuba it was Gene had then? doublebuzzing wrote: That's interesting that Barenboim preferred the sound of the BBb. I wonder what type of tuba it was Gene had then? I'm not sure, but he's been showing off a Big Mouth Brass BBb lately. [on this tangent] I let one of the Marine Band's tubists noddle on my VMI 3302 5-valve BBb once, and he remarked that if such a nice-playing BBb tuba had been available when he was in college, he would've never switched to CC.